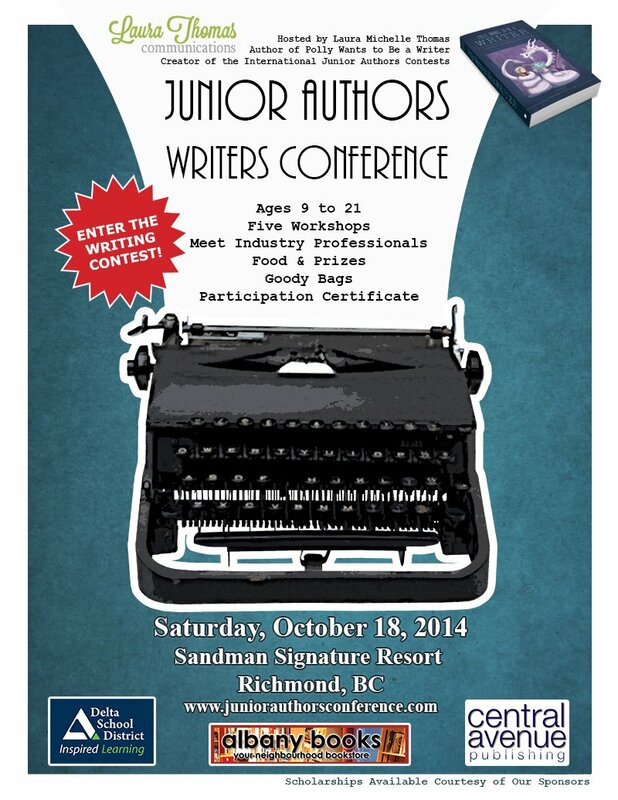 This is what we did in 2014 at our Junior Authors Writers Conference in Canada. With or without the t-shirt, Your choice! 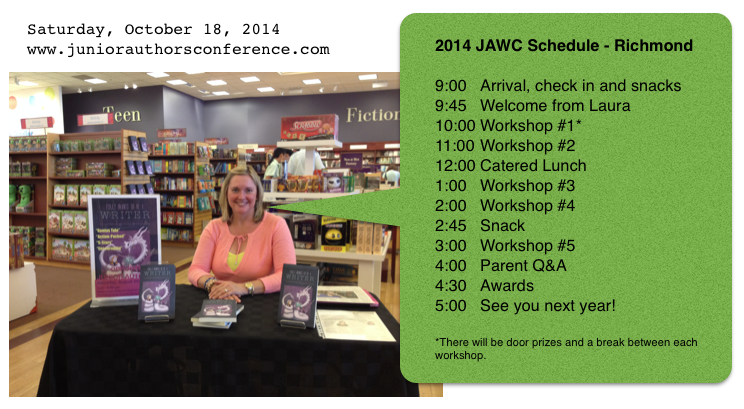 Five workshops on the art and craft of writing and the publishing industry. See our speaker line up below. A t-shirt for those who purchase the $99.00 ticket. Please note: We may have a limited selection of t-shirts available on conference day. If we do, they will be $15.00 each. NEW! Participants have the option of ordering a special edition LTC t-shirt at the time of registration for $10 CAD. Artwork by Ken Rolston who did the cover art for Polly Wants to Be a Writer. Every young writer who comes to the conference is welcome to submit a piece of writing for our special conference writing contest. The top two winning stories will be read at the conference and be published on jaBlog! in October/November. Each winner will receive one of our new LTC Insider Plus+ Memberships. Write a short story (fiction) of no more than 500 words that takes place during the lunch break at a fictional young writers conference. The title and your personal information do NOT count towards your total words. Just count the words in the body of your story. Email to Laura no later than midnight Wednesday, October 15th, 2014. The 2 winners will receive one of our brand new LTC Insider Plus+ Memberships and have their stories published on jaBlog! Laura Michelle Thomas, B.A., B.A., M.A., is an author and semi-retired professional copywriter and ghostwriter. She has been mentoring young writers in workshops, camps and courses since 2007. She has worked equally with homeschoolers and students in public and private schools, including those in gifted programs. Some of her students have gone on to have stories and poetry published in prestigious magazines like Stone Soup. She is also a mother with a daughter and step-son and a professional children’s storyteller, who was storyteller in residence at Science World, Vancouver for 2012. Laura also has experience working with writers with special needs, including autism spectrum and ADHD. More recently Laura formed a communications company through which she fosters the development of young writers worldwide through quality contests, conferences, blogging, books, and educational resources. She is the author of the 5-star hybrid novel and writing guide Polly Wants to Be a Writer: The Junior Authors Guide to Writing and Getting Published. The Junior Authors Conference is specially designed to recognize, affirm, inspire, and delight young writers ages 9 through 21. The workshops will be kept short. There will be lots of breaks, good food and opportunities to meet other young writers and some industry professionals. Click here to view a video from our 2013 Conference which took place at this same location. Read testimonials from past participants. Blogger Journey Meyerhoff interviewed Jacqueline for jaBlog! Good historical fiction is like a time machine that takes readers back into the past─to a time and place where the characters live and breathe. This workshop will explore the process of researching and writing historical fiction and introduce some basic tools and tips for making history come alive. It will also touch on how some of these same tips can apply to writing about the future. Participants will try out their own “time travel” skills through a writing activity. Jacqueline Pearce is the author of ten books for children and teens, including Discovering Emily, about the 19th c. childhood of Canadian artist Emily Carr, The Truth About Rats (and Dogs), about a boy who smuggles home a pet rat, and Manga Touch, which follows a teenage girl’s exchange trip to Japan. In her newest novel, Siege, the main character finds himself dodging ghosts and musket fire in the middle of a War of 1812 re-enactment. Jacqueline grew up on Vancouver Island and has a bachelor’s degree in English Literature from the University of Victoria and a Master’s degree in Environmental Studies from York University in Toronto. LTC Social Media Assistant, Cathy Yan, interviewed Linda DeMeulemeester for jaBlog! How to you provide reader cookies to an audience? What should you feed a plot bunny? Who in the story gets ‘save the cat’ scenes? 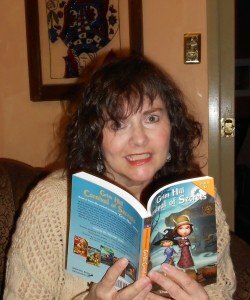 The answer to these questions and more are revealed as Linda weaves in stories and pointers about her writing process and how she became interested in stories of adventure and mystery – and the inspiring ideas that led her to begin writing Grim Hill. Participants will share brainstorming sessions on how to make and keep a story interesting for readers. 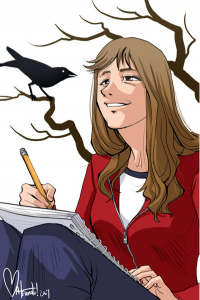 She will also share with students some of the bumpier parts of the writing process including the story of her most miserable rejection and the hard work of editing. Linda’s spooky mystery middle-grade Grim Hill series, published in Canada by Lobster Press came out of the gate to great success as the winner of the Ontario Library Association Silver Birch Award and selected by the Canadian Toy Testing Council for the “Great Books of 2008.” The series went on to become the flagship for the small publisher where it was designated a hot ticket item with Scholastic Arrow Book Club, made it to the Canadian bestseller list, and was optioned for an animated T.V. series. LTC US East Blogger, Lucy Zhang, interviewed Michelle Halket for jaBlog! The options for getting your work read are greater today than ever before. In this session, you will learn what those publishing models are, from traditional publishing, to doing it yourself, to exploring the new forms of publishing like blogging and file sharing. Moreover, you will learn what you need before you get started and how to know which form is right for you and the type of work you produce. Central Avenue is a press featuring writers of original fiction, poetry and selected non-fiction. They look for talented, driven and committed writers. They also distribute books published by ireadiwrite Publishing, Saberlee Books and their romance imprint, Everheart Books. Their goals are to treat writers with respect and integrity while bringing to market entertaining books and authors that connect with readers. Michelle Halket is a self described bibliophile and technophile. The creator of Central Avenue Publishing, Michelle’s extensive background in account management and market research has loaned itself to creating a successful press that is riding the wave of digital books while maintaining a strong relationship with its authors and readers. 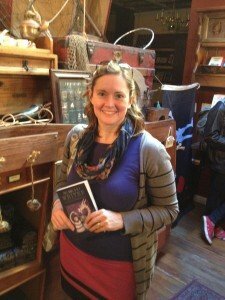 LTC UK North Blogger, Rhianna Urquhart, interviewed Michelle Barker for jaBlog! Readers become engaged in a story when the characters seem real. If they are stereotyped or wooden, they fall flat and the story dies. But how does a writer create realistic characters? Are there secrets for how to make a CV-list of accomplishments and traits come to life? Absolutely! 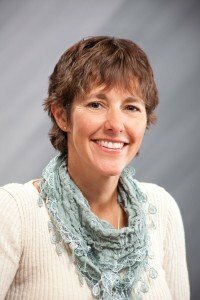 Michelle will discuss effective physical description, the importance of character motivation, and ways to show readers who your characters are rather than simply telling them. Michelle Barker was born in Vancouver, BC. She received a Bachelor of Arts in English literature from UBC and worked as an editor and researcher before turning to writing full time. She has published short fiction, non-fiction and poetry in literary reviews, magazines and newspapers. In 2002, she won a gold National Magazine Award in personal journalism. Her chapbook, Old Growth, Clear-Cut: Poems of Haida Gwaii, was published by Leaf Press in 2012. Her poetry appeared in The Best Canadian Poetry in English (2011). Her first novel, The Beggar King is a young adult fantasy that was published in 2013 by Thistledown Press. Presently, Michelle is finishing up her Master’s degree in creative writing at UBC’s optional-residency program. This workshop will focus on how to get a book noticed by the public and reviewers. Topics will include: best practices for name recognition, including reviewing books, social media, and other forms of attention that are growing in popularity at the same time traditional media is shrinking. 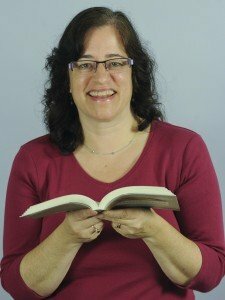 Tracy will talk about best practices for contacting book editors at newspapers, what reviewers look for in deciding which books to review, and what happens after a book is selected for review. Tracy Sherlock is the books editor and education reporter for the Vancouver Sun Newspaper. She has worked at the Vancouver Sun for seven years as both an editor and a reporter. She has worked in the writing business since the late 1980s. Send the email by September 30, 2014 to Laura Thomas at laura@laurathomascommunications.com. Please note that the scholarships cover all or a portion of the conference registration fee. We do not provide funding for travel or other miscellaneous expenses. We would like to thank our sponsors Central Avenue Publishing, Delta School District and Albany Books for making it possible to offer scholarships. On or Before October 4 – Refund less a 5% administration fee. Please make your request by email. Between October 5 and 15 – Refund less a 15% administration fee. Please make your request by email. I went to the conference. It was really helpful!